After painting Hierogamus (Sacred Marriage), it seemed important to paint the drum. To explore and maybe come to understand what was calling to me. 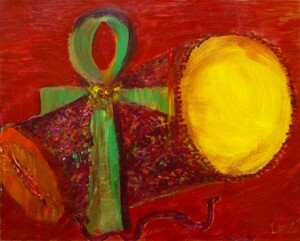 The ankh is the Egyptian symbol for life and very close to the modern female symbol for Venus and female. The ankh hieroglyph also means mirror – a pun that the ancient Egyptian hieroglyphics are full of. I look deep into myself and stand as a woman next to the drumming male. Recently (2006) Tom has taken to using “Qi” as a moniker. It’s the modern Chinese spelling for Chi, the study of which is a key has been a key to understanding his own soul. Does the snake tie us together like the 2 of Rivers in the Shining Tribe Tarot Deck? Mysteries continue to abound.